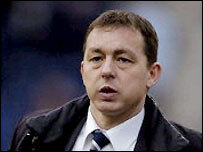 Charlton have decided against appointing Preston boss Billy Davies as their new manager, according to PNE chairman Derek Shaw. "I have been informed by Charlton that they are going to 'move on'," Shaw told Preston's website. "Charlton will not be pursuing Billy Davies any more and said they would like to thank PNE for our co-operation and apologise for any disruption." Shaw added that he had turned down an approach from Derby County. "We have today (Thursday) had a request from Derby to speak to Billy, which we have turned down," said Shaw. "That is all we will say on the matter." Davies, 41, had an interview with Charlton on Monday after Preston granted the Premiership club permission to talk to their manager. The North End boss said after his interview: "I can say I had a very good meeting with them. "Basically I am considering all the options. It is just a question of thinking about the future. "I found Charlton to be very good people, very, very good people. The discussions went great. "It is just now a matter of looking at the whole picture and making the right decision." But Charlton, who have been linked with Iain Dowie, who left his post as Crystal Palace manager on Monday, have now decided to look elsewhere. And Shaw added: "I would like to thank Charlton for their professionalism in this matter, as I feel they have done everything by the book. "Billy will be back at Deepdale continuing with his preparations for next season." Charlton are looking for a manager following Alan Curbishley's departure from the club.